Yeah, but: Has the whole world gone mad? The Long Version: I'm one of those people who was caught by the ultra-thin form factor of the Motorola Razor, or as the hip call it, MOTORAZR. It looked like no phone before it, and even though it wasn't actually much smaller, its thinness was revolutionary and so much more modern than those blocky ones that it sat next to on the display shelves. It was an expensive phone, but the price-with-contract was good enough to get me off of my grandfathered billed-by-the-second plan into a contract that had less features and was more expensive. It was also the first contract I had signed for phone service, so I also wasn't anticipating the massive drop in customer service that came with being locked into one company. But I had my new phone, and it was good. I've had my Motorola phone for two years, eleven months, one week and six days. I know this because there's a hundred dollar penalty if I up and leave before the full three years is served. So three years and one day from when I signed that contract, I'm moving to a new company and getting a new phone. When people ask me why I'm so enthusiastic about replacing my current phone with a new one, I tell them that it's an original 'Razr'. Whether they work for my provider, or my future provider, they just nod their heads in complete understanding. The sound quality's not very good. The programming is bad. Menu options are in odd places. The screen can't be read in anything approaching daylight. The battery life was never very good, and after a year or so the rechargeables won't store enough power to get me though an easy day. The alarms can't be silenced without completely disabling them, meaning that it constantly needs to be reset for events that happen every day - like waking up in the morning. The chime on the low battery alarm can't be silenced without silencing the phone's ringers as well. Hitting a button to silence the ringer when I'm screening calls doesn't stop the phone from chirping at me to tell me that I missed a call. And the sound quality's not very good. Great design idea - lousy phone. 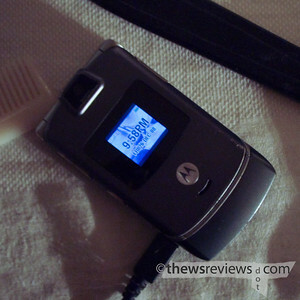 The launch of the Razr V3 marked a sales peak for Motorola, which they still haven't surpassed. For a very good reason, since so many people bought the stupid thing. It could have been great, and maybe the new Motorola phones - including the RAZR derivatives - have come close to that. I'll never know; the vast number of Motorola phones that my current carrier offers is one of the three reasons why I'm leaving them in fifteen days. There's a new phone that I'm looking at, and the company advertises it as having a GPS. I'm a sucker for satellite navigation, so I asked about that feature and tried to get some idea of its capabilities. If it could replace my hand-held Garmin, I'd be thrilled. But apparently I was over-ambitious, because eventually the sales person said to me "It's not a GPS, it's a phone." Let's play fill-in the blanks: It's not a _________, it's a phone. Camera? Video camera? Music player? Portable TV? Web browser? Two-way pager? Walkie-talkie? Radio? E-mail client? Photo viewer? Personal Digital Assistant? Video game? The amount of things that so-called phones can do is amazing. Kids and adults alike have their Crackberries and iPhones, when just a few moments ago they were exclusively for executives and/or tech geeks. I was looking at other reviews of the MOTORAZR, the cutting edge that's oh-so-three-years-ago, and found this gem: "Even though it doesnt have a full QWERTY keyboard like most phones..."
WTF? Most phones have typewriter keyboards on them? When did I get so old? Phone GPS just enables the provider (and be extension, anyone) to track your movements 24/7. Get a phone that allows you to disable GPS--that option still lets it work for 911 in the USA so if you're in trouble help can find you. Still waiting for it to come on the free phones my provider gives away. Verizon--don't have too many complaints about them or the LG phones. The cell phone company can do a pretty good job of tracking you even without GPS, especially if you're in an area with dense cell towers. Not pin-point, but close enough to testify in court as to where you might have been. I'm not sure if I want qwerty. But I'm even less sure that I can afford to be without it.